In Monkey Jump we pick up not long after the ending of the last book Cold in California. Monkey Jump; I admit the name really caught my attention right off the bat and having read and really liked the first book in the series there was no way I could say no to picking up the second! Vampires, or any other paranormal creature for that matter, do not just disappear into non-existence like in some books. Usually the vampire is already considered ‘damned’ because of what he is. In the Twice-Baked Vampire Series they have to worry about the great after-life just like everyone else. Don’t get me wrong, as far as I understand it not everyone gets the in-between some people just go one way or the other but Gabriel is one of those who go to the in-between or what everyone that is there with him call the ‘Tank”. There are tanks all over the world but theirs is in Los Angeles. In the last book we were left with Gabriel now being in charge of the tank and his girlfriend Dori Gallagher (who had always thought she was human but now finds she was a Muse) is in the tank with him after her death. As the new leader of his holding tank, a job that means he has to take care of all of the other’s there, Gabriel learns that he is being sent on a Monkey Jump by the powers-that-be to see other tanks around the world and how they run things. He is allowed to take two people with him. He chooses Dori, feeling it will give them more time together and leprechaun, a highly annoying leprechaun he takes mostly just to get him out of the way of the other people at the tank as they work on their new home after the destruction of the last tank in book one. Of course things go wrong. The witch from the ending of the last books does some damage, the Soul Eater Carson comes along for the ride looking for more souls and they end up in Alaska. Not only Alaska but a town as odd and unusual as the tank and whole redemption thing was to Gabriel just a few weeks ago. It is populated by humans, vampires and shifters. It is notoriously known that shifters and vampires do not get along but in the town of Maxtla somehow...it works. However they could not have shown up at a worse time; the darkness is coming. Sixty days with no light and each year it drives the vampires closer and closer to the breaking point, striking them faster each year. I really liked this book. I said it with the first book and I will say it again; the author has created something really unique here. Never before have I read a book that is anything quite like this series and this second novel also throws in the Arthurian ledged as well! Overall Monkey Jump is a fast paced, highly interesting and unique book about the paranormal world that held my attention completely. I am looking forward to more by Deborah Riley-Magnus, and hope it will be another book in this series! 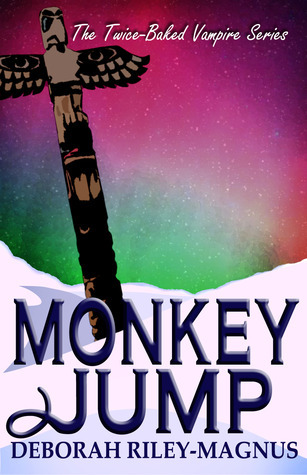 I would recommend Monkey Jump to anyone who read and liked the first book of the series. I would recommend the series to anyone who is looking for a unique paranormal series.